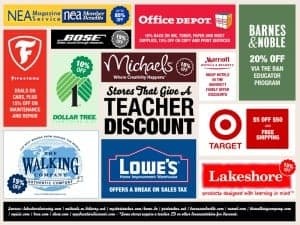 Teacher Discounts: 100+ Stores That Will Give Teachers a Discount! | Happy Deal - Happy Day! Teacher Discounts: 100+ Stores That Will Give Teachers a Discount! We have almost hit the mid summer vacation mark. Back-To-School sales are in full swing. But we can’t just think about prepping our students! Teachers need discounts too! Read this best last-minute summer discounts and upcoming back-to-school discounts for teachers! Then head over here and you can find a list of 100+ stores that will give you a discount if you are a teacher! There are many clothing stores that I didn’t know you could get a discount for, for just having your teacher ID! Even Joann Fabrics and Michaels will give discounts on full-priced items! There are many on this list I totally did not take advantage of while I was still a teacher – so check this out, and share with all of your teacher friends! 2 Responses to Teacher Discounts: 100+ Stores That Will Give Teachers a Discount! This is absolutely fantastic as teachers are by far so underpaid for the services they offer to our children, and parents as well. I really hope other stores will consider joining the efforts of giving them some financial relief. Thank you for the reference!